Nikita Avdiushko, Duke University – Fuqua School of Business MBA Student, contributed to this post. Chief Marketing Officers (CMOs) are leading the charge as companies rush to become digital-first. These leaders are transforming the customer experience (CX), working collaboratively with sales, product management, IT, and customer service to drive this change. Many are their company’s de facto Chief Digital Officers, too, so it’s hardly surprising that the latest CMO Survey finds that digital dominates when it comes to corporate marketing budgets. Here are some insights from our latest biannual survey, conducted between July and August 2018, with 324 leaders from a survey pool of 2,895 top marketers at U.S. for-profit companies on marketing spending. CMO Survey respondents, 95.3% of whom are VP level or above, are allocating more dollars than ever to digital. These leaders expect to spend a full 54% of marketing budgets on digital within the next five years, up from 44% today. Not surprisingly, digital advertising continues to take share from traditional advertising, with the former gaining ground by an expected growth rate of 12.3% and the latter slipping -1.2%. 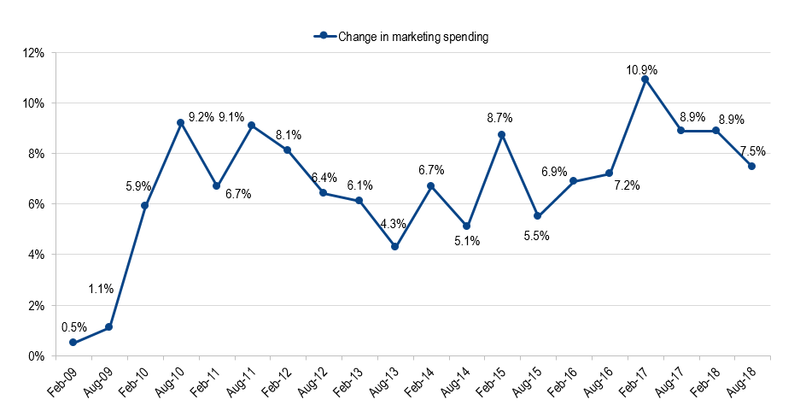 In other types of marketing spending, brand spending has increased over the last five years from a 4.3% yearly increase to a 7.3% increase, CRM spending increased from a 7.9% yearly increase to a 9.5% increase, new product introduction spending decreased from a 7.8% yearly increase to a 6.3% increase, and new service introduction spending increase from a 4.5% yearly increase to a 6.1% increase. All sectors are enjoying marketing spending growth, but the B2C sector has the lowest increase, with a 4.3% rise for B2C Products and 4.4% rise for B2C Services over the next 12 months. That is likely because the B2C market is mature and may be bracing for a China trade war. Marketing budgets for B2B Products are expected to grow 8.8% and B2B Services 9.2% over the next 12 months, reflecting the fast growth of technology-enabled industries and rapid adoption of “as a Service” solutions, driven by SaaS solutions, data analytics, and other digital services. Not surprisingly, the technology/software/biotech sector is now the #1 sector for expected growth in marketing spending, edging out education, the previous big spender. Look for this trend to continue for the foreseeable future. While companies, on average, experienced a 7.5% rise over the last 12 months and expect a similar 7.5% growth for the next year, growth is actually decelerating and has been so for some time (see Figure). The high watermark for marketing spend was achieved in our February 2017 CMO Survey, when bullish respondents looked forward to a heady year, anticipating 10.9% growth. With two years of record growth nearly complete, companies are reducing spend incrementally. It will be interesting to see whether slower, but sustained, growth continues, as I expect it will. With the stock market firing on all cylinders, unemployment at a record low, and the rise of the platform economy, growth prospects are good. Yet the threat of tariffs on Chinese goods and retaliation on US exports, economic unpredictability in Turkey and other markets, increasing analyst alarms about overstretched valuations, and corporate and national debt hang heavy in the national consciousness. Marketing spending, which seeks to drive revenue while creating sustainable value, naturally reflects those trends. We’ll continue to monitor the pulse of the thoughts (and wallets) of the nation’s top companies. What’s in Your Marketing Budget? This is an important question that marketers frequently ask me about! The answer, summarized in the Table below, is that direct expenses of marketing activities dominate, of course (92% of companies), followed by social media (82% of companies), marketing employees (74%), marketing analytics (73%), marketing research (67%), and other overhead costs associated with marketing (66%). There is then a sizable drop-off with only 47% of companies including mobile marketing in marketing budgets, marketing training (47%), sales support tools (41%), and sales employees (22%). These percentages vary quite a bit across four of the major economic sectors we track. Marketing budgets as a percentage of total firm budgets have remained steady over time. Over the last five years, the percentage has remained between 9.4% and 12.1%. Likewise, marketing spending as a percent of company revenues is currently at 7.3% (6.6-9.3% over the last five years). Although the percentages are reasonably robust over time, they range quite a bit across economic sectors. B2C Product companies allocate considerably more to their marketing budgets as a percentage of total budget (17.2%), compared to B2C Service (11.6%), B2B Product (8.5%), and B2B Service (9.6%) companies. 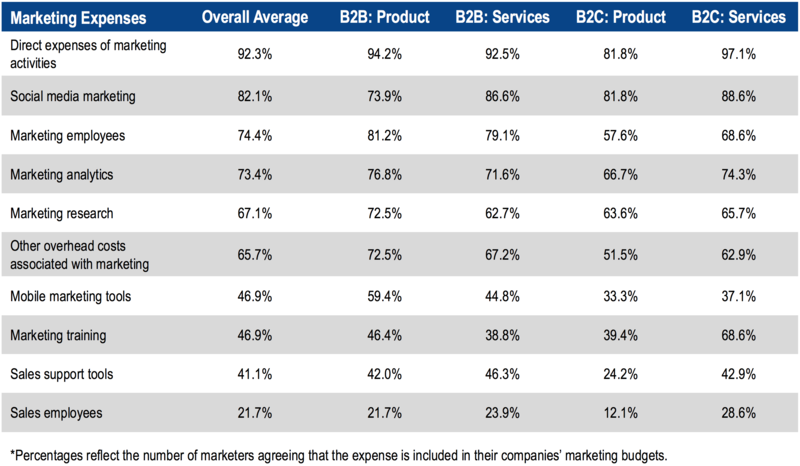 Likewise, B2C product companies have marketing budgets that are 10.1% of their firm revenues, compared to B2C Service companies (8.9%), B2B Service companies (7.1%), and B2B Product companies (5.4%). You can find details for all of these trends in three different free reports available from The CMO Survey here. Click here to participate in the next CMO Survey.